[PDF] It Ain't Sauce, It's Gravy: Macaroni, Homestyle Cheesesteaks, the Best Meatballs in the World, and How Food Saved My Life | Free eBooks Download - EBOOKEE! Description: Has cooking ever saved a life? It definitely rescued Steve Martorano from the streets of South Philadelphia, and an almost certain end in jail â€¦ or worse. Raised on Gramâ€™s meatballs and Momâ€™s macaroni, Martorano learned at an early age that full-flavored food made with loving hands was the only food worth eating. And, by the way, thatâ€™s macaroni and gravy, not pasta and sauce, cuz. Thatâ€™s just the way it is in Martoranoâ€™s world. When it seemed like the only future for a kid from the neighborhood was to drive a truck or join the mob, it was this passion for food that inspired Martorano to reach for more and start his first â€œrestaurantâ€â€”selling homemade sandwiches he prepared in his motherâ€™s basement. These sandwiches, served up with a side of Steveâ€™s personality, turned out to be the recipe for success and started Martorano in the restaurant business. Eighteen years after opening the incredibly popular Cafe Martorano in Fort Lauderdale, Florida, Martorano now runs a total of four successful restaurants in Florida and Las Vegas, and has built a devoted and ever-growing clienteleâ€”including a bevy of celebritiesâ€”who are more than willing to wait hours for a table. In this personal, funny, delectable cookbook, the self-proclaimed â€œheavyweight champ of Italian-American cookingâ€ offers us a wide range of the dishes that have made his restaurants so popular. Among the bookâ€™s seventy-eight recipes, youâ€™ll find tried-and-true favorites like Martorano Meatballs, Fresh Mozzarella, Stuffed Hot Peppers, and Fried Galamad Red (known as calamari outside Philly), as well as newer fare like Grilled Octopus, Rice Balls, and Sunday Pork Gravy with Rigatoni (featuring braised pigsâ€™ feet). And donâ€™t worryâ€”Martorano doesn't skip the cocktails or dessert! Expect to indulge in Peanut Butter Cake with Peanut Butter Zabaglione, Cannoli Cream, Tuscan Lemonade, and Sicilian Mules. 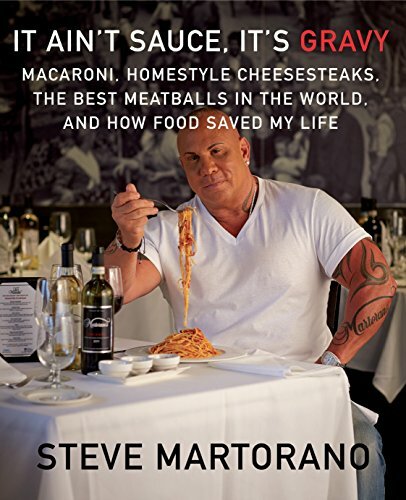 Steve Martoranoâ€™s It Ainâ€™t Sauce, Itâ€™s Gravy delivers all the staples of delicious neighborhood-style comfort food, served up in the authorâ€™s one-of-a-kind, deliciously fun-loving style. 2017-10-14[PDF] The Most Important Graph in the World: ..and How it Will Change Your Life! No comments for "[PDF] It Ain't Sauce, It's Gravy: Macaroni, Homestyle Cheesesteaks, the Best Meatballs in the World, and How Food Saved My Life".